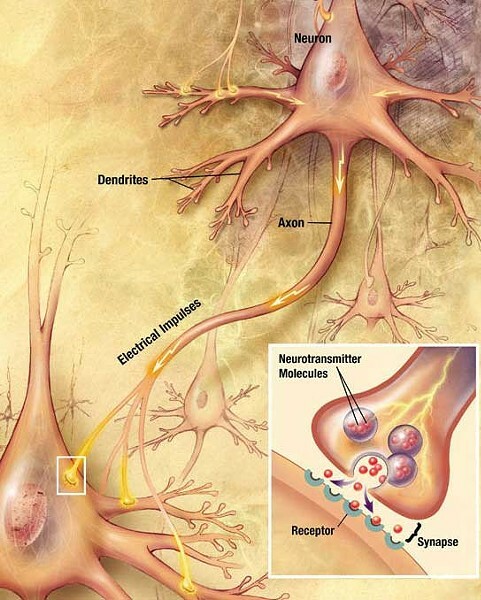 U.S. National Institutes of Health, Wikimedia Commons Simplified diagram showing how neurons communicate. Until the advent of computers a few decades back, the technology du jour gave us metaphors for the brain. As I've written before (Field Notes, Dec. 6, 2012), hydraulic and pneumatic systems, steam and internal combustion engines, septic tanks, cotton mills and telephone switchboards have all been tapped for brain metaphors as thinkers try to understand thinking. Since about 1950, however, computers — from basic hardware and software systems to the internet as a whole — have consistently occupied that primetime metaphor spot. One problem with any brain metaphor is scale. Each of these three-pound lumps of gray neural network wetware squished into deep folds and valleys inside our skulls contains about as many neurons as there are stars in the Milky Way. That's a hundred billion neurons, give or take, each of which has hundreds of connections with its neighbors. We're not even close to reproducing that sort of complexity even in our most advanced parallel-processing computers. Another problem, the one I want to discuss here, is the one of predictability. Computer neurons, that is, silicon-based input-output switching devices, have no functional leeway. Give any one of them a certain input and it'll respond with a certain output, day in, day out. If actual neurons were similarly reliable (and boring), how could we explain our flashes of entirely unpredictable inspiration and creativity that seem to come out of nowhere, not to mention our delusions, obsessions, depression, anxiety and all the rest of our fickle inner lives? Why would we experience ourselves as capricious, subject to both genius and craziness, if neurons were simply switches? In answer to that question, philosopher Dan Dennett has taken brain metaphors to a whole new level. A couple billion years ago, he reminds us, before the dawn of multicellular life, the progenitors of our neurons were independent, self-contained eukaryotic cells (cells with nuclei) that "lived and fended for themselves for about a billion years as free-swimming, free-living little agents." As they were co-opted into the multi-celled clusters that we know as our bodies and brains, most of them made the transition without struggle. So, today they work in harmony, unswervingly and loyally. Most of them. Dennett proposes that a genetic mutation caused some cells, especially those that ended up in our cortical areas, to return to their primitive states, "like what happens when you let sheep or pigs go feral, and they recover their wild talents." The idea is that on occasion, some neurons rebel, creating fiefdoms that struggle amongst themselves for dominance. When that happens, the normal cooperative democracy of our brain cells gives way to an anarchy of infighting, resulting in the complex gamut of emotion and inspiration that seems to be a hallmark of our species. Could there be any truth to this rogue neuron scenario? At this point, it's impossible to say one way or another. What Dennett's proposal does do is to question the assumption that the neurons of a brain are all on the same team. And, as in so much of science, the question may be more important than the answer. Barry Evans (barryevans9@yahoo.com) counted the neurons in his brain and found himself short by a few million. Which didn't come as a total surprise.